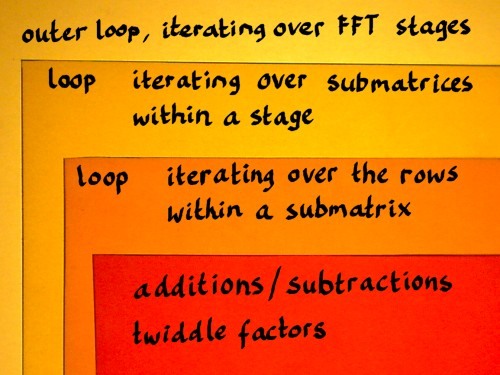 A routine for this FFT could or should be organised as a series of nested loops. I have seen this principle outlined in texts on FFT, notably in The Fast Fourier Transform by E. Oran Brigham, Numerical Recipes in C by William H. Press e.a., and Kevin 'fftguru' McGee's online FFT tutorial. The point is that I had a hard time to understand the mechanics of it. So I went step by step, studying texts and code, and working out my coloured square paper models in parallel. FFT was like a jig saw puzzle for me, and this page reflects how I was putting the pieces together. When we look at the FFT factor matrices, there is a kind of virtual vector size that is smaller and smaller in each consecutive stage. In the first stage, this size is N/2 and in the last stage it is reduced to just 1. 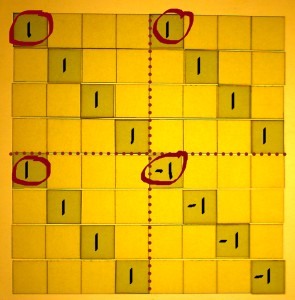 N/2 can also be defined N>>1, which means N shifted right by one bit: 1000 becomes 0100. It is a pure power of two everytime. Instead of using 4 as a constant, or writing N/2 a couple of times, it would be efficient to store the value in some variable, and update it in every stage. I will label this variable 'span', as that seems an appropriate title for this essential parameter. From 0100 it will shift to 0010 in the second stage and to 0001 in the third stage. After that it will shift right from 0001 to 0000, which is also boolean 'false'. That is where the outer loop should end indeed. Therefore the variable span can also regulate the conditions for the outer loop. Index numbers can now be referenced as x[n] and x[n+span]. 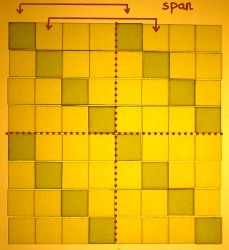 That is how we can identify sample pairs for addition/subtraction. 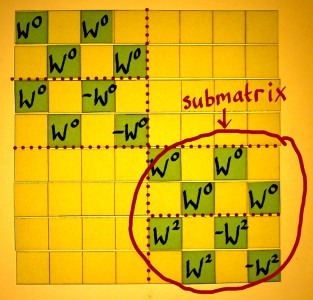 This identification method will only run smooth when the work will be done on one submatrix at a time, within each stage. 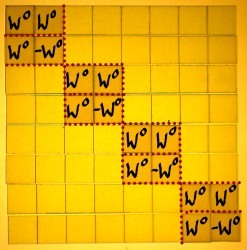 Otherwise x[n] will overlap with x[n+span]. 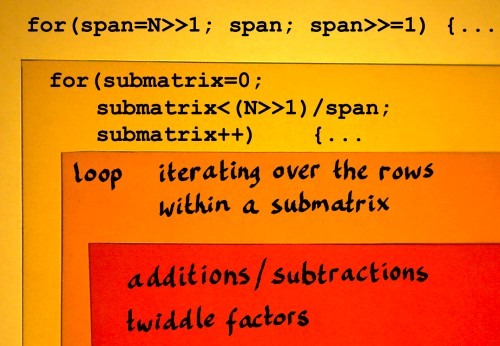 We could write a for-loop that iterates over the submatrices in a stage. 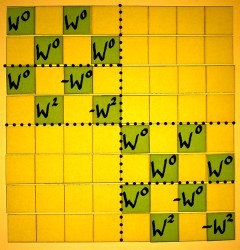 We bring x and x together, and perform addition of these on one hand, and subtraction on the other hand. After that, the results go their own way again. 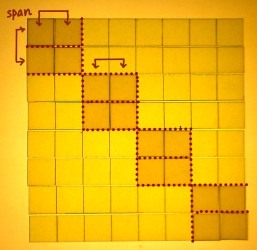 After finishing the iterations over the nodes, n has to jump over the x[n+span] values. But it must not get bigger than N. It can be done like: n=(n+span)&(N-1). The &(N-1) is a bitwise-and mask, for example: binary 11111 is such a mask in the N=32 case. 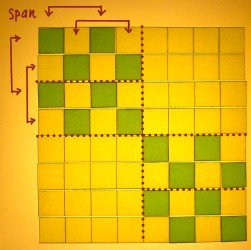 Now it turns out that for each n, the value [n+span] is already computed six times. Shall I not store this value before the additions and subtractions, in a variable called nspan? (Yep). What comes next? 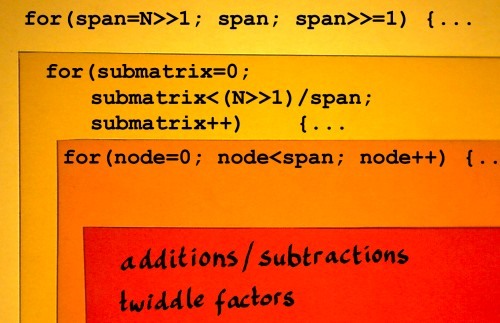 We need to multiply the x[nspan] output values with twiddle factors. This is best done while these output values are still at hand, in the CPU registers (hopefully) or else somewhere nearby in cache. The twiddling is therefore inside the loop over the nodes, the innerest loop. 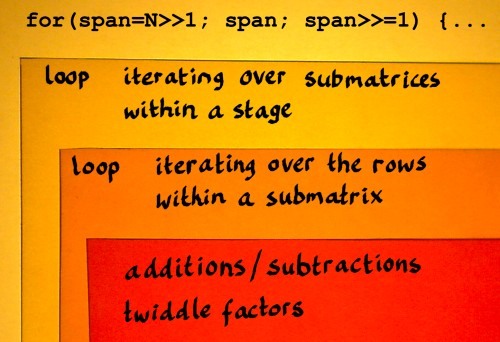 Directly after the subtraction x[nspan]=x[n]-x[nspan], x[nspan] can be updated with the twiddle factor. 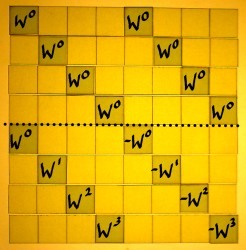 Again, this is somewhat more complicated in real life, as it concerns a complex multiplication. And furthermore, we do not have these twiddle factors computed yet. So here I really have to start a new topic. 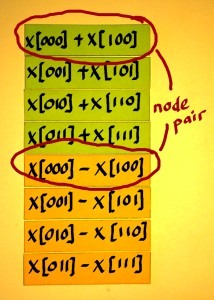 For the next node, n must be incremented. We're done! Let me now put these codebits together. With some twenty lines of C code we can have an FFT function. The output of this FFT appears in bit-reversed order, so for analysis purposes it does not make much sense yet. I will figure out bitreversal on a separate page. Furthermore, the output is not normalised in any way. Of course, this simple FFT code is still highly inefficient. The real killer is: the calling of standard trigonometrics, cos() and sin(). Why is that so? For one thing, the hardware FPU trig instructions generate 80 bits precision output by default. They really take a lot of clock cycles. If we are to optimize the code, here is the obvious point to start. The next page shows some modifications.